DPW will offer FREE paper shredding for city residents. Residents can bring up to two garbage bags of documents to be shredded. 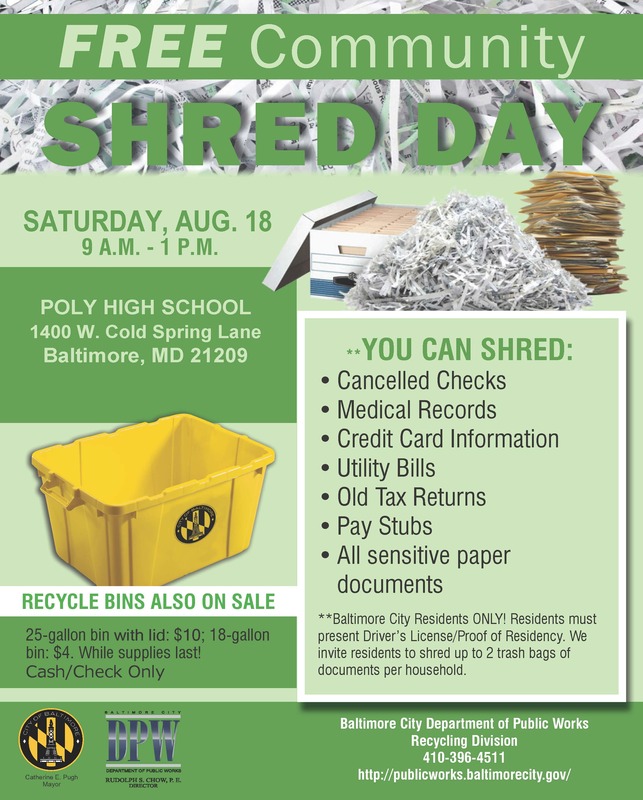 The bin sale and free paper shredding will take place Saturday, Aug. 18 from 9 a.m. to 1 p.m. at Poly High School, 1400 W. Cold Spring Lane Baltimore, Md. 21209. The bright, canary yellow recycling bins will be on sale at deeply discounted rates. Baltimore residents can purchase the 25-gallon bins and lid for $10 (regularly $12) and the smaller 18-gallon bins are on sale for $4 (regularly $5).